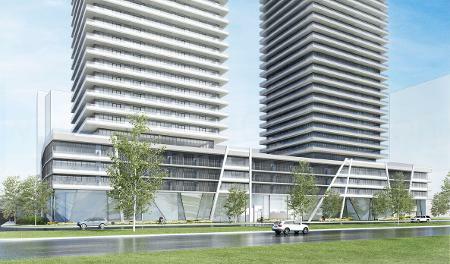 Mirabella is a new residential high-rise condominium development by Diamante Development Corporation currently in pre-construction located at Lake Shore Boulevard West and Windermere Avenue in Toronto, Ontario. It consists of two 35 storey towers connected by a five-storey podium designed by Scott Shields Architects & Wayne Swardon with a total of 760 proposed dwelling units. Diamante Development Corporation achievements so far include over 2000 residential units in Canada. Diamante’s pursuit of design perfection is relentless. Their scrupulous attention to detail and quality is exemplary and their technical expertise transforms inspired ideas into outstanding living spaces and successful financial real estate investments and developments. The Diamond Condominiums - The Diamond Condominiums on Yonge in the heart of North York’s City Centre represents a rare opportunity. Tall and impressive, The Diamond offers breathtaking views and exquisitely designed spaces, including a landscaped private garden and the sophisticated lifestyle amenities one has come to expect from a condominium residence presented by the Diamante Development Corporation. 100 Davenport Condos - Coming Soon. The proposed development is a 39-storey mixed-use project containing 16,756.93 m2 of residential gross floor area. By contrast, the iconoclastic Cardinal's design for a 39-storey residential tower at 100 Davenport Road receives its inspiration from the natural world, with Diamante Development's building designed to "open up like a flower to the sun.". 100 Davenport would join a neighbourhood that has seen rapid high-rise growth over the last decade. The Florian Condos - Another project by Diamante sold out and complete in the heart of Yorkville located at 76 Davenport Road. Trendsetting design and one of the finest locations in Toronto, in Upper Yorkville, make The Florian the premier condominium choice for people who are looking for an address of exclusivity. Set within lush gardens and minutes from first class amenities the residences of The Florian are without comparison. The Florian's Amenities will ensure a lifestyle of grace, elegance and ease. The Attentive valet service and 24-hour concierge will provide a seamless interface with your day to day needs; the indoor swimming pool and fitness centre will suit residents interested in serious exercise or luxurious relaxation; the sophisticated entertaining rooms, with catering kitchen, are a perfect venue for your social events; and a fourth floor rooftop garden with summer bar offers a serene, beautifully landscaped outdoor retreat. Together, Diamante Development Corporation and Scott Shields Architects & Wayne Swardon. 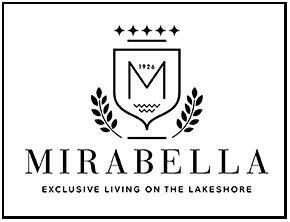 have collaborated to design and develop the Mirabella Condos coming soon near Lake Ontario and located to the south of High Park. Interior Design: Stanley Kedzierski & Urban Parallel Interior Design + Planning. Register with us today for more details on the Mirabella Condos by Diamante Development Corporation Private Equities! For more information, please register today for the Mirabella Luxury Condos.